It is well known that “only what gets measured gets attention”. The availability of information on health services performance can empower Community Health Workers (CHWs) and their supervisors to improve the quality of the community-based health services. Also, there is a need to link the health information generated by CHWs to the facility-based routine health information systems (RHIS). Yet, in most countries, this vital information on health services provided by CHWs is not routinely captured. Liberia has a long standing history of a community health program, which was developed and managed by non governmental organisations (NGOs). While CHWs have been contributing to improve health conditions in the country, the Ministry of Health and Social Welfare (MOHSW) lacked the capacity to regulate service delivery. In 2011, the MOHSW in collaboration with the USAID funded Rebuilding Basic Health Services (RBHS) project developed a National Community Health Policy and Plan, which elaborates on the community health components of the Ten-Year National Health Plan. As the national health policy and plan pledged to improve access to health care, the national community health policy and plan put forward a strategic direction on the roll out of the community health program including the design and the development of a community health information system. 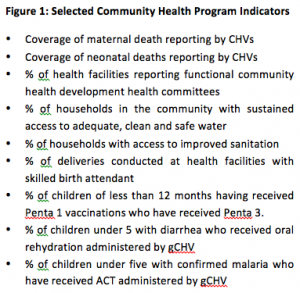 Community Health Workers in Liberia are volunteers (CHVs), as defined in the community health policy. Two types of CHVs are recognized: general community health volunteers (gCHV), and trained traditional midwives (TTM). The functions of gCHVs include raising health awareness of individuals, families and communities and encouraging a healthy life style. They provide support in national preventive health campaigns against various endemic diseases. In some remote communities, they are also trained to manage selected childhood diseases (iCCM). TTMs are engaged in helping pregnant women to plan and receive appropriate care during pregnancy, as well as to accompany pregnant women to deliver the baby in the health facility. In 2013, the MOHSW conducted a survey of all community health volunteers in the country. The survey enumerated 8,052 CHVs including 3,727 gCHVs and 2,856 TTMs. Liberia has a functional national health management information system (HMIS) which captures data from the health facility on services provided as well as the data on administrative and management outputs. The National Health Policy and Plan 2011-2020 envisages that the national health management information system will be expanded to include information sub systems, such as for community health services, for logistic management systems, and for laboratory services. 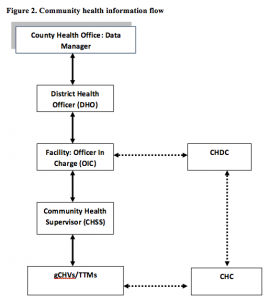 In the past two years, the MOHSW has invested considerable efforts to design a Community Health Management Information System (C-HMIS). 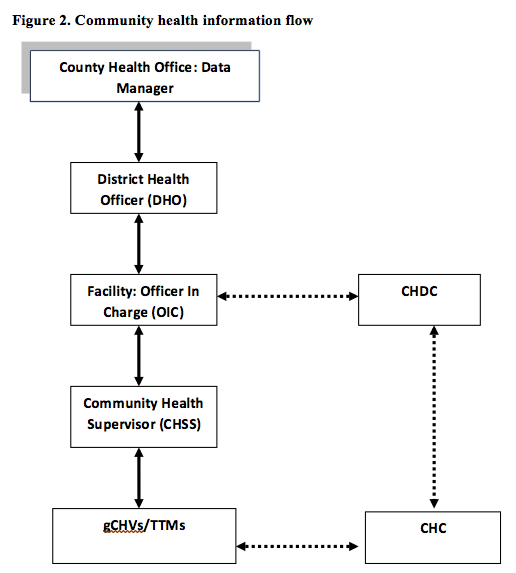 The C-HMIS links information from the services provided in the community to facility level information. Hence design and the implementation of C-HMIS is an important step toward making the national HMIS inclusive and comprehensive. 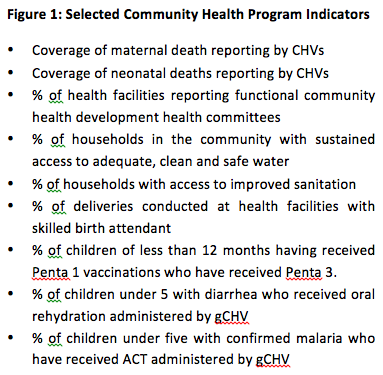 The C-HMIS has been designed based on a standard list of indicators (see Figure 1) reflecting the main services provided by the CHVs. The data collection system consists of a series of recording tools for gCHVs and TTMs separately. The recording forms have been developed into ledgers that are bound with hard cover pages. At the end of the month selected data from the CHV ledgers will be reported in a single CHV monthly report form. CHVs report their monthly activities to the Community Health Services Supervisor (CHSS). The CHSS reports to the health facility, the health facility reports to the District Health Officer (DHO), DHO to the County Health Team (CHT). This flow is depicted in Figure 2. At county level, C-HMIS data are processed electronically through the same software application as the facility-based HMIS. This application called DHIS2 allows analysis of the data from facility-based health services as well as community-based services and is able to calculate the contribution of each to improving the health outcomes. To participate in the C-HMIS, the health facility should implement the community health program as prescribed by national community health policy. In the coming months, a massive training program will be launched to scale up the C-HMIS to all government health facilities. Private and NGO facilities may participate if they are recognized by the county health team and are given well defined catchment areas. The initial training will be followed by intensified supportive supervisory visits, to assist managers, care providers, and community health volunteers in using the C-HMIS information for decision making at all levels. It is expected that the new C-HMIS will give a major boost to the performance of the Community Health Program and improve the quality of the services provided by the CHVs. This in turn will create further demand for services by the population, translated in gradual expansion of the Community Health Program to all communities in Liberia. Check out Liberia’s CHW activities on the 1mCHW Campaign Operations Room.